Lately, M has been taking a thermos of soup in her lunchbox. Every Sunday evening, we make a big pot of soup that will last through the long school week. Recent recipe choices have included cream of broccoli, minestrone, vegetable beef, and other favorites. I’ve also been baking cornbread muffins to accompany the meal. I bake them in silicone muffin liners for easy cleanup. This Creamy Corn Bread recipe gets its sweetness and creaminess from the corn and yogurt in the mix. No need to add sugar, this bread is sweet, moist, and satisfying! Preheat oven to 350 degrees. Combine ingredients in a medium bowl; stir well. Pour into a 9×5″ loaf pan coated with cooking spray or spoon into lined muffin pans. Bake at 350° for 40- 45 minutes for loaf pan or 17-20 minutes for muffins. No sugar? Fabulous! Looks delicious, will definitely try this with soup season here! Most of the sweetness comes from the corn, Nancy. While I don’t add any sugar to the recipe, the boxed mix has sugar in the ingredients. Thanks for your comment! And a good idea to put soup in a thermos. One of those moments were I’m why in the world haven’t I thought of that?! Soups are delicious when the weather is getting chillier, but has not been an opition for my hubby as we ride our bikes to work. But it would work in a thermos, that would not leak! I just seem to love all about this post: I also find it interesting to hear that you cook a soup that last your family for a whole week. Luckily we don’t have to pack food to daycare, I get such cheap “homemade” lunch at work (part of the rehabilitation of people with mental illnesses to cook, we get to enjoy the products for the price of making it), so it is only cooking dinner AND something for my hubby to take along for lunch. But even for that my ideas and time to do the cooking week evenings always seems to be scarce. But now: soups. Easy. And creamy corn bread. Yes, soup is a good idea. Make sure you find a good quality thermos so that half of it doesn’t spill out before you have a chance to eat it. I am going to be posting one of my soup recipes tonight. Along with a trick that I have for freezing rice balls to drop in the soup as well. That might sound kind of silly but the rice keeps in the freezer for the week and it adds carbs to the soup. Thanks for sharing your comments with me…I really appreciate your taking the time to share a bit of your life with me. Have a good day! I love corn bread. Will be happy to try this. Thanks! This has a bit of a cornbread casserole quality about it. Very moist and substantial…I hope you like it. Thanks for your valued comment! I absolutely love the pattern on the muffin pan and all your bakeware! Where’d you get it? And putting yogurt in cornbread to make it creamier is a fantastic idea – I already have a standby recipe but I might have to try subbing yogurt in! This bakeware is called Temp-tations. I have had it for a couple of years and I absolutely love it. Your going to chuckle when I tell you that the only place that I have seen it sold is on QVC. I wait for a really good deal or for when it goes on clearance and then I buy it. I have more than I need at this point, but I do use it everyday. As for the muffin pans, I use silicone liners for easy cleanup. They are so great…environmentally favorable and totally non-stick. I got a deal on them several years ago after Christmas (75 cents for 12) but I have also seen them on Amazon for a really great price. I love corn bread! 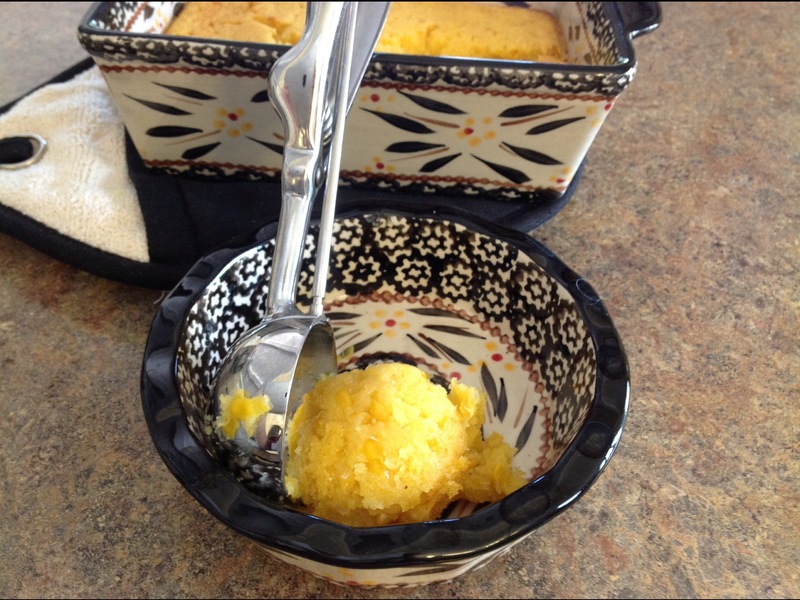 I like how simple this recipe is, and the corn bread looks so delicious 😀 Thanks for sharing! It is easy to make…I try to keep a couple of cans of corn in the pantry so I can throw this together in a pinch. Great with chili too! Thanks for your comment! Mmmm looks delicious! 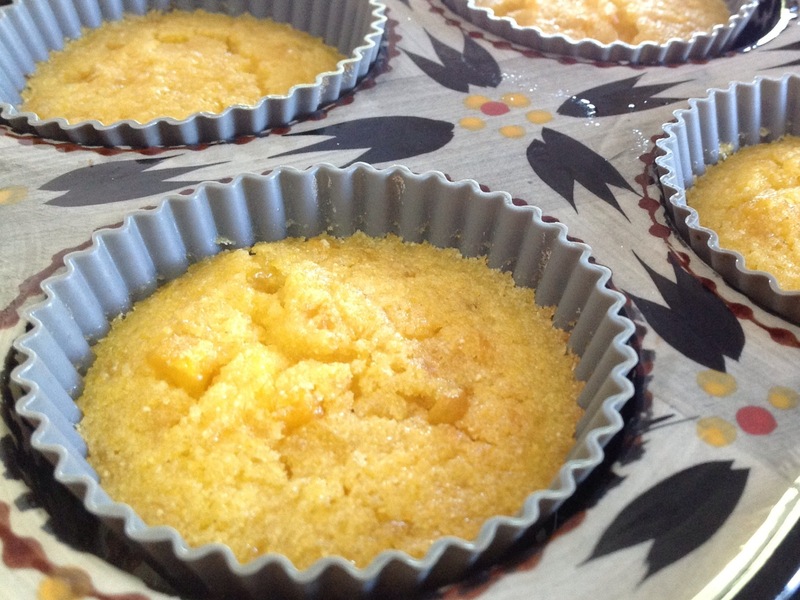 My kids love corn bread, must try this! My daughter just loves it and this is her favorite recipe. Thanks for stopping by and commenting…enjoy your day! Thanks for the plug! Your canning picture looks amazing…you’ve been busy! what would you use in place of corn muffin mix? as they don’t sell that in australia. That’s a difficult answer for me. I was thinking that you could find a corn bread master mix on the Internet and try that but I don’t know about the quantities that would work for this recipe. I would feel terrible if my alternative recommendation didn’t work for you. Hopefully, Jiffy Brand or Betty Crocker will start making the corn bread mix for you in Australia. Keep looking in your baking isle at the grocery store. Thanks for your comment…sorry I couldn’t be of assistance…have a good day.